With the Concept GLB at Auto Shanghai (April 18 to 25, 2019), Mercedes-Benz shows what SUV ideas on the company's compact car platform might be realized alongside the GLA as a sporty all-rounder. While the latter promises engaging driving enjoyment with its coupe-like lines, the Concept GLB places an emphasis on spaciousness with a robust character. The concept car (length/width/height: 182/74/75 in) has space for up to seven occupants, thanks to its long wheelbase (111 in). A number of sturdy features also signals that the Concept GLB feels right at home on rough tracks. Here is the Ener-G Force concept car put to production form, so Mercedes does build concept cars. I think this looks amazing inside and out and I don’t like crossovers. The “active lifestyle” millennials that will never go off road will buy these up in waves because they think they’ll go off road and haul kayaks, just like they think they’ll commit to going to the gym 4 times a week as a New Year’s resolution. 3rd row seat even if just for kids is a huge plus in this segment and Mercedes now has three 7 seat SUVs after having only 1 last year. Also important because people don’t buy the seats they need they buy the number of seats they Might need. The production interior probably won’t be that, but I hope they offer that Alcantara and stitching and leather in a designo package. Also the roof lights, gotta offer that too. I like the concept interior, esp. in brown. The exterior is nice, not the mini-G-class as was rumored. A blinged-up production vehicle isn't a true concept. And this is still a "concept"- we all know how hard daimler pulled back with the new g-class after showing the ener-g concept. The Ener-G concept is the GLB. The Ener-g concept was not a G-Wagon concept. I thought it would have had more G-Wagen in it as well. This is the Ener-G concept comps to life. I do think this looks rather good, it might be their best looking SUV other than the G-wagen which is kind of love itnor hate it because of how obnoxious it is. GLB is NOT the Ener-g force concept. To quote their own website!!! 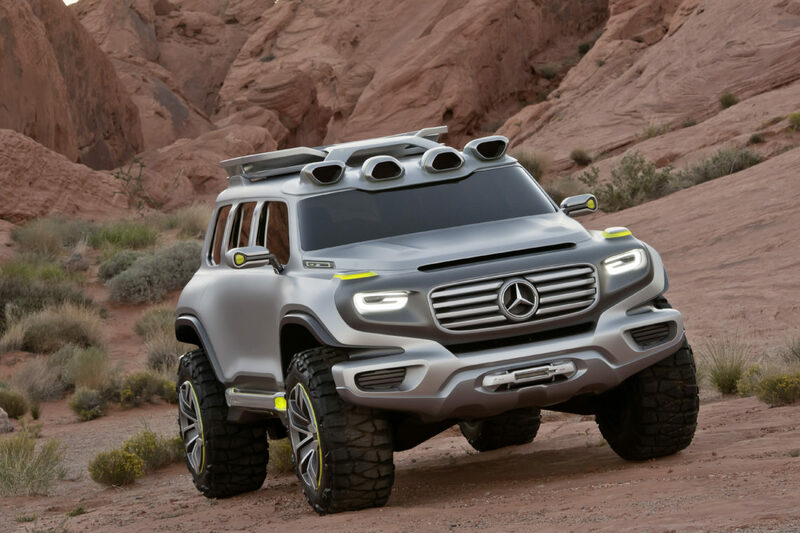 “The Ener-G-Force is the vision of an off-roader that, while reflecting tomorrow’s adventures, also invokes the genes of the Mercedes-Benz off-road icon, the G model,” observes Gorden Wagener, Head of Design at Mercedes-Benz Cars. “Modern and cool, it could also be a clue about a new beginning for the off-road design idiom of Mercedes-Benz”. GLB looks a lot like that. That concept "invokes genes" of the G-class, that is like when Chevy puts out a Blazer that is inspired by a Camaro, that is all marketing speak that has nothing to do with anything. They never said Ener-G was a preview of the next G-wagen, the G-wagen wasn't going to change styling. GLB is for "tomorrow's off road adventures"
Wrong, if you actually read the web site, the Ener-G-Force is the size and concept of a future G-Wagon. Not a Small compact knock off with some style cues from it. GLB is not the Ener-G-Force. That was never a future G-wagon, why would they ever change the styling? in 2040 the G-wagen will look the same as it does today. Because it's the W-Body Impala of Germany. Worse than that- it's older than dirt. Just imagine tho if the recent so-called 'redesign" of the g-wagon HAD been the ener-g concept, as shown; as the flagship it would have a pretty substantial trickle-down effect instead of being a left field Frankenstein of 1970s parts that you can't tell if it's a 1980 or a 2020. I’ll give Benz credit. They at least show pics of the most expensive trim when releasing to the press. The reality is though that most of them sold will not carry the same high end material and colors schemes of the top of the line trim shown here. Take away the two tone color and you have a pretty boring design given the make and supposed “best or nothing else” marketing behind it. I’ll give Benz credit. They at least show pics of the most expensive trim when releasing to the press (concept or otherwise). The reality is though that most of them sold will not carry the same high end material and colors schemes of the top of the line trim shown here. Take away the two tone color and you have a pretty boring design given the make and supposed “best or nothing else” marketing behind it. Oh and only 224HP on a seven passenger SUV? Seems like someone here has some crow to eat given their history of slamming brands Ike Cadillac and Lincoln for their “weak” engine offerings. But nothing else is going to look like the G-wagen, that is why it is an icon. The biggest flaw I see in Mercedes design is with the SL. That should look like the 1955 version and be a retro style to be to the car side, what the G-wagen is to the SUV side. Compare the GLB to an XT4 or NX200 or 250 or whatever Lexus calls their small SUV which has almost the exact name a s Nissan commercial van. And we know 300 hp is right around the corner from launch of the base model, which is more than any of these other compact 4-cylinder SUVs have. That is just future guessing. Says right above that they are using the 224HP four banger and offering a bigger option down the road is a cop out (seeing as how that 300HP offering is for the much overused “AMG” model that will cost at least $20K more than the XT4) and proves my point about offering a weak motor on a seven passenger SUV. You also go the apples to oranges route yet again since the NX200 and XT4 don’t offer seven passenger seating (and with good reason). On top of that, Benz is supposed to offer more, according to your past comments. Here, they offer less and you offer up excuses you do not grant to Cadillac or anyone else not wearing a German label. No one offers 7 seats in this segment. A win for Mercedes. The GLB 35 won't be a $20k premium, the 45's are a $20k premium. I was dismissive of a Renegade sized vehicle. Something that is nearly GLC sized and can seat 7 is another matter entirely. I am actually really interested in this. @smk4565 Why no comment on the engine? It has less horsepower than the XT4. It can't even shut down cylinders like the Cadillac can. Could be a good Encore replacement for you based on needs you have stated here in the Forums. yeah. I need something sooner than this will be available. Plus, I don't want to buy new. Current thoughts are to replace the Cruze with a Canyon and replace the Encore with a 300S. My complaint with XT4 and XT5 and XT6 is only 1 engine choice. If 224 hp isn’t enough a 300 hp will be available probably at launch or close to given that the work is done on the 35’s. And they might do a 400 hp GLB45, I would be surprised if they AMG everything. For the women that lease these appliances, 1 engine choice is enough. The XT* aren't performance vehicles, just FWD/AWD generics. XT4, XT5 and XT6 will probably get some engine updates and a v-sport would make sense. I see no reason that Cadillac could not V series everything. At least there is cylinder on demand with the Cadillac, this thing has pathetic horsepower. Clearly someone is mainlining meth as this is not the company line of "Best or nothing at all!" Might as well be nothing at all with this! He’s still looking for a way to move the bar again and make another apples to oranges comparison to justify any shortcomings on the part of Mercedes.